These Pet Rescue level 672 cheats and tips will help you beat level 672 of Pet Rescue. 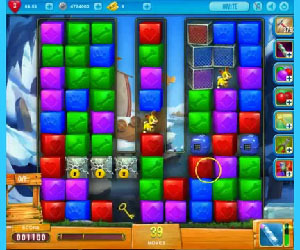 The objective of Pet Rescue level 672 is to rescue 9 pets and get 3,000 points in 50 moves. The pets will fall down on the board on the right side of the board in Pet Rescue Saga level 672. The pets will drop down in their cages. Make combinations with the same color blocks next to the pet cages in order to open them up. Once the pets are free, look to make matches on the right side underneath them. At the top of the center column, there is a key in a glass block. The key unlocks the three locked blocks that are on the bottom left side of the board. Look to bring the key down to the bottom to break it free from the glass. Once the blocks have been opened you will be able to make more combinations on the left side of the board to help you bring down any remaining pets. You will be given one line blaster to use to start the level. Once you free up the middle column, another line blaster will drop down. Wait to activate the line blasters until you really need them. Look to activate the line blaster in a row where it will help you to bring down the pets or remove any blockers, like the wire mesh blocks.